One important unit of American history centers on African American history. For teachers of American history in Loudoun County, these resources are invaluable. Thomas Balch Library provides information about the history of African Americans in antebellum Loudoun and afterwards, including the legal impact of the 13th, 14th, and 15th amendments. Further, the Library documents the struggles of blacks and other civil rights leaders to ensure the full equality promised by these post-Civil War additions to the U.S. Constitution. To acquaint teachers with this rich archival resource and the educational materials that support the curriculum, the Friends Education Committee and the Black History Committee have developed tours and maps, community profiles, timelines, books, and oral histories. Our most comprehensive resource is "A Glimpse Into the African American History of Loudoun County." You can access the full compendium and its many linked documents here. For an introduction to "Glimpse," see item #6 below. From its beginnings America has been a multicultural and evolving society. This is reflected in all aspects of life in Loudoun County, Virginia, but the contributions of African Americans have not been included and documented fully. This timeline provides a starting point for teachers, students, and historians to begin to fill in the the African American story. It is a work in progress and will be updated as needed. The landscape of Loudoun County reflects the industry and achievement of African Americans in the post-emancipation years. Together they created, in the words of an African American folk saying, "a way out of no way." They shared what they had and invested tremendous energy in family, home, work, education, worship, and fellowship. Of the settlements they built, many survive today, including St. Louis, Mount Pleasant (Scattersville), Howardsville, Irene, Conklin, and Guinea Bridge. 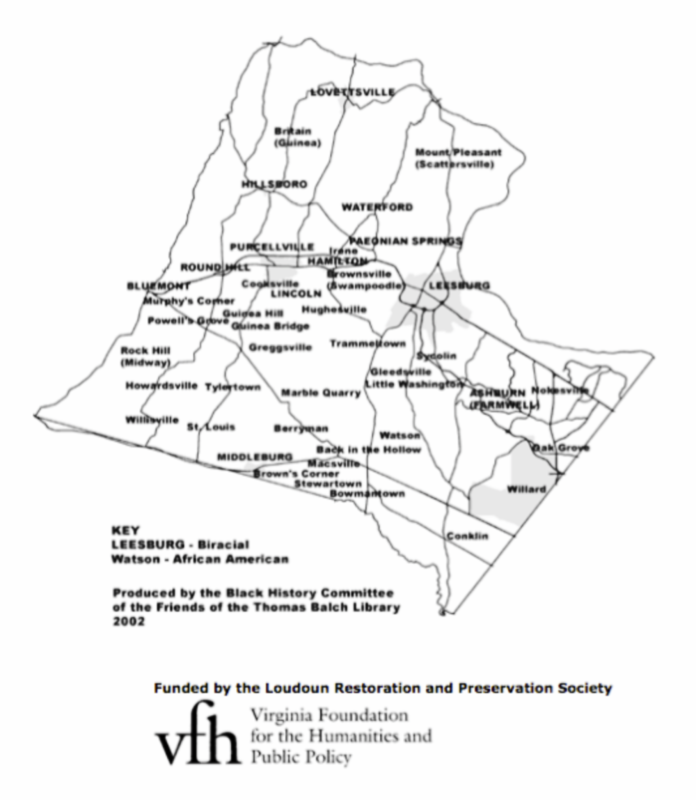 A project of Friends of the Thomas Balch Library Black History Committee, this history of African American Communities in Loudoun County, written by Deborah Lee, provides a helpful resource for teachers. Communities profiled in this document are shown on the map below. To enlarge the image in a lightbox, click on the map. A National Park Service program, the National Underground Railroad Network to Freedom “provides technical assistance to organizations that are attempting to identify, document, preserve and interpret sites, . . .routes, and landscapes relating to the Underground Railroad.” Thomas Balch Library, Oatlands Plantation, and the Loudoun County Courthouse are all members of this network. Yardley Taylor's 1853 map of Loudoun including the Quaker community around Goose Creek Meeting. Throughout Loudoun County were individuals who took active roles in helping enslaved people escape to the North. This document provides starting points for further research into their activities and communities. The detail from the famous 1853 map of Loudoun County by Yardley Taylor shows the Quaker community of Goose Creek Meeting, now Lincoln, with the home site of leading abolitionist Samuel Janney and Taylor's nursery business. 5. A special community-wide collaboration —"A new school - Frederick Douglass Elementary." This Power Point presentation commemorates the history of Frederick Douglass Elementary School in Loudoun County and provides timelines of the black history in American at the local, state, and national levels. 6. An Introduction to"A Glimpse Into the African American History of Loudoun County," below. "Glimpse" is our compendium of primary documents and excerpts from secondary sources available at the Balch Library. It was researched and compiled by the Friends Education Committee and the Black History Committee. The materials tell the story of African American history from a Loudoun County perspective. "Glimpse" is organized by Eight Essential Understandings and Supporting Documents relevant to the Virginia Standards of Learning (SOLs). Below is an outline of the materials. For the full content, click here. Supporting Documents: Virginia Birth Register, a listing of the 34 largest slave-holding families in Loudoun County, a chart listing the distribution of slave ownership, runaway slave advertisements for William Lee, Lewis Berry, Moses, Edmund Baylie; story of escapee John W. Jones, the will of Mary Marks, the will of Margaret Humphrey. Supporting Documents: Register of Free Negroes, Record of Free Negroes, a Certificate of Freedom for Joseph Trammell, Ye Meetg Hous Smal, a Short Account of Friends in Loudoun County, Virginia 1732-1980, Lucas-Heaton Letters (Mars Lucas, Albert Heaton). Essential Understanding #3. In antebellum Virginia, some blacks were free. However, free blacks were subject to Black Laws enacted by the Virginia Legislature. While some of these laws protected free blacks, most limited their freedom. Despite these limiting conditions, some free blacks worked to resist the enslavement of their brethren. Supporting Documents: An Overview of Black Laws by Joan Peters, Black Laws of Virginia, Excerpts, stories of Harriet Cook, William Obediah Robey, and Leonard Andrew Grimes. Essential Understanding #4: The Emancipation Proclamation (January 1, 1863) freed some slaves, but the Thirteenth Amendment freed all slaves, while the Fourteenth and Fifteenth Amendments insured their citizenship. The documents from the time immediately after the Civil War reflect efforts by various groups to solve post-war problems and adapt to the new political, social, and economic order. Nevertheless, the adjustments of both blacks and whites to this reconstruction environment proved challenging. Supporting Documents: Photographs, newspaper articles (1865 - 1867), and Black Laws of Virginia, Civil War excerpts. Supporting Documents: Historian Elaine E. Thompson's Introduction to Loudoun Museum exhibit Courage, My Soul: Historic African American Churches and Mutual Aid Societies. photographs, newspaper articles (e.g., "social rights bill," jury service), story of an important community leader, Howard Willard Clark, Sr. Supporting Documents: A series of letters exchanged in 1940 between black community leaders of the County-Wide League, NAACP attorney Charles Houston, and the superintendent of Loudoun County Schools provide the primary support for the Essential Understanding above. This correspondence, along with newspaper articles and other related documents from the period, focus on the struggle of black citizens in the county to see a fully accredited black high school built in Loudoun, and to secure for their children other educational services enjoyed by white students, and guaranteed by the 14th Amendment. (Ratified 1964): No poll tax in federal elections. This legislation tightened the Fugitive Slave Law, making it much more difficult for slaves in the South to escape. The freeing of slaves in areas still rebelling against the union. A law desegregating public facilities. Protection of a citizen’s right to vote. As your students use the documents at this site, they may find certain vocabulary words and terms unfamiliar. For your convenience, a vocabulary list is included here. Although it is not comprehensive, it will provide a basis for building a more complete bank of words with your students.